The nation that July’s Book of the Month hails from is not represented on the A Year of Reading the World list of 195 UN-recognised states plus Taiwan. One of the 22 republics representing ethnic minority groups in Russia, the region now known as North Ossetia-Alania was absorbed into the bigger country in the mid-19th century and has been part of it ever since. Had I read this book back in 2012, I would have had to file it under ‘Russia’ or perhaps put it among my ‘Rest of the World’ contenders. Much like his homeland, novelist Alan Cherchesov, who is also founder and director of the Institute of Civilization in the North Ossetian capital Vladikavkaz, is little-known in the English-speaking world. Indeed, it was only by chance that I heard of him. Having read Andrei Volos’s mini masterpiece Hurramabad – one of the most exquisite books I encountered during my project – for Tajikistan, I received an email from Natasha Perova at the publisher Glas New Russian Writing. She thanked me for my review and suggested a couple of other titles on their list that might interest me. Two years later, as I began to look around for stories to consider for my Book of the Month slot, I remembered that email and tracked down the works on it. 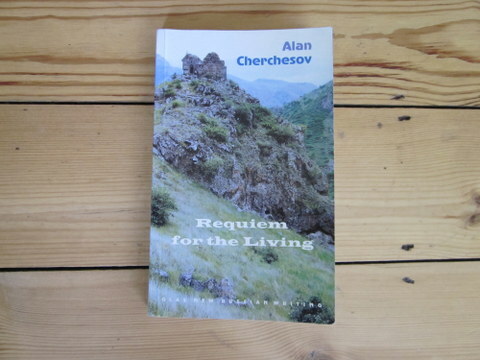 And I’m very glad that I did, because in Cherchesov’s novel, Requiem for the Living, I discovered one of the most extraordinary narratives I have ever read. Relating the exploits of a mysterious orphan, Alone, who comes to live in a remote mountain aul (village) as a child and gradually assumes control of the entire community, the novel weaves a haunting and troubling picture. As the population contends with the arrival of the sinister Belgians who are intent on exploiting the region’s resources, the contempt of the ethnic Russians and the locals’ own blind adherence to feuds and traditions, we see the inscrutable protagonist manipulate the course of events ‘twining the multicoloured threads of all these individuals lives together’ in a brave and painful attempt to escape his own dubious past. Part fable, part morality tale and part epic, the novel – narrated by the son of one of the other main characters – reveals how loyalties can at once bind us together and tear us apart. Cherchesov has a gift for evoking the remote world of his story through succinct descriptions. From the prison cell with ‘two dozen bunks, soiled plasterwork, and a permanent atmosphere of stubborn, lonely fury’ to the powerful narration of a horse and cart careening over a precipice, he brings the strange, dreamlike events of his narrative close to us. The same is true of his encapsulation of the feelings and anxieties of his characters in small details. The observation, for example, that for an Ossetian villager ‘speaking Russian in front of a crowd of people was almost like stripping naked in public’ tells us all we need to know about the relations between the two ethnic groups. In particular, Cherchesov is a master of portraying conflicting emotions and reveals again and again how emotional weather can change in the space of a sentence, as rapidly as the mist rolls in to shroud the aul. Using a technique known as free indirect discourse, he plaits the narrative into the thoughts and words of his characters, laying bare the way we buck and struggle under the pull of irreconcilable concerns and desires. Episodes such as the unravelling of a love triangle involving a jealous shopkeeper and the narrator’s father, the morning-after curdling of tenderness between Alone and the prostitute to whom he loses his virginity, and his drunken rant to the narrator after a girl kills herself for love of him come alive because of the inconsistencies that the author threads through them. For all its brilliance, though, the novel does come with a sizeable health warning. This is not an easy book. Indeed, the word ‘labyrinthine’ might have been coined for it. From the sentence level up, it is intricate and demanding, often switching between time periods and perspectives in a handful of words. This is made all the more challenging by the fact that there are no section or chapter breaks, so that the narrative is a single 351-page chunk. The reason for this could be, as a German critic writing in Die Welt has suggested, because the work owes a lot to a complex Eastern literary genre known as ‘divan’, in which threads weave together like the patterns of a carpet. While this may be true, it does not make for a relaxing read. In particular, Cherchesov’s tendency to withhold backstory until very late in the narrative can make for moments of extreme bafflement as characters’ carry out seemingly bizarre actions that only make sense much later. Nevertheless, the book rewards those who persevere. I’ll warrant few of us raised in the Western literary tradition will have come across much like this before. It is certainly one of the strangest and at times most mesmerising stories I have ever read. And, like the region it comes from, it deserves to be more widely known. It seems that it’s a very interesting book =) Gonna try to find it!